It’s been a while since we’ve visited the Newport Aquarium, but after Becky from The Savings Lifestyle reminded me that Winter Family Days are going on now through February 28, we decided to head down to Newport on the Levee and see some aquatic life. During Winter Family Days, two kids (ages 2-12 years) get in free with each adult paying full price (adult tickets are $22/person and normally a child’s admission is $15/child). We parked in the parking garage for $3 then made our way to the Riverwalk. 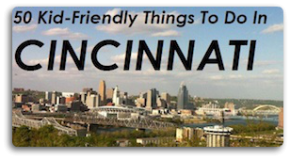 Take a few minutes and check out the views of Cincinnati from the Newport side – our Queen City is really something to see. After purchasing our tickets, we even got a bonus when the ticket attendant gave us our brochure and two coupons for a free kids meal at Bob Evans restaurants. Thanks Sammy the Shark . When you first enter the Newport Aquarium, you can’t help but notice the huge Blue Whale wishing well replica in the lobby. It is something to see. I’d suggest leaving your heavy winter coats in the lobby – the attendants will hang your coats for you and give you a coat tag. It makes it much more pleasant to view the exhibits without Mom or Dad having to haul all the coats around. Plus, when you enter the Rainforest and see the Lorikeets you will be glad the coat is M.I.A. Even though it has been at least three year since our last visit, my oldest still remembered that she wanted to pet the sharks, see the penguins and jellyfish and walk through the aquarium tunnels. Since we visited on a holiday weekend, the place was hopping. Even with the larger crowd, we were still able to see quite a lot. One thing that all of us enjoyed was the Dive Theater show. It was really exciting to see the volunteer divers in the large shark tank talking to us while sharks, Denver, the sea turtle, and many other fish were also swimming around. New to us was the Frog Bog and my girls loved it. This colorful exhibit has over twenty species of frogs and toads for you to enjoy. The Colorado River Toads sure looked well fed. In the center of the exhibit there’s a large climbing structure with tunnels, tubes and slides for the kids to enjoy. There’s also a larger than life “Frogger” game which was very popular as well as huge frogs the kids can climb on while the parents get their “Kodak moment”. 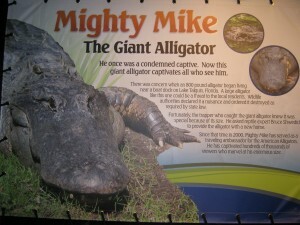 We also got to see Mighty Mike (he’s 800 pounds) in the Gator Bayou and he sure looked mighty. I don’t think I’d want to cross paths with this gator. We got lucky since Mike actually decided to move about a bit and since they have a see through floor we got to see him slowly move under the walkway. Mighty Mike had no idea the traffic jam he was creating up above. Now if you want to see Mighty Mike, make sure you visit before the end of Spring since he’s got other places to go and people to see (a zoo in Michigan may be his new home). The highlight for my girls was petting the sharks in Shark Central. Here, the girls learned the two-finger pet technique and they had a great time waiting for the sandsharks to pass their way. The only drawback is that they may get wet so it’s not a bad idea to have an extra shirt in the car just in case. My husband even said this was one of his favorite exhibits too. The girls also liked seeing how much they weighed when they sat in the shark sling. Turns out they both are in the Pyjama Catshark category (35-59 pounds). Although it was tempting, I elected not to get in the shark sling. There is so much to see that it’s hard to do it all in one visit. 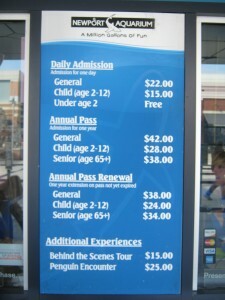 Click here for a Visitor’s Guide to help you with your planning. If you think you might like to come back for another visit, think about purchasing their family season pass ($140 for 2 adults/2 children). The Newport Aquarium is open 365 days a year from at least 10am-6pm and in the summer they extend the hours from 9am-7pm. After our aquatic adventure was over, we were all hungry and since the Hofbrauhaus House has kids eat free on Sunday we walked over there. Entering the large Bier Hall transported you to another place and time. There was a large crowd enjoying beer, festive music, dancing and food. We even got to see a full on audience participation Chicken Dance. But, since the Bier Hall allows smoking, we opted to sit in the non-smoking room. Even though we lost some of the fun ambiance, we still had a nice time. The only snafu we had was when I asked if it was Kids Eat Free, the server said they didn’t have Kids Eat Free on Sunday. She was very nice and I showed her how it was listed on their website and she said it wouldn’t be a problem. So, if you are going for a special deal, it’s always a good idea to double check this before you go. I then asked one of the managers when kids eat free was and he confirmed that they do have it on Sunday, Monday & Tuesday. Kids meals are normally $3.99 and include a small soda but if you’re looking to be on the healthy side, there weren’t too many healthy choice options for kids. They have pizza, chicken fingers, hot dogs, grilled cheese & burgers that are all served with french fries. Maybe adding the option of having applesauce and/or carrot sticks to the menu would be a good idea. We started off with yummy soft pretzels with bier cheese and they were hit with all of us. The menu consists of “traditional Bavarian dishes” (think Brats, Metts, sauerkraut balls, potato pancakes and more) plus they have soups, salads and sandwiches. The Hofbrauhaus House has a lively festive atmosphere and is a great place for all ages to enjoy. beams or furniture. Water removal can be complicated especially if it also includes flooded basement. I mean, I don’t want to tell you how to run your website, however suppose you added a headline that grabbed a person’s attention? 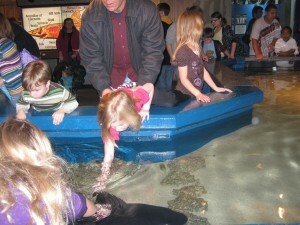 I mean Winter Family Days at the Newport Aquarium | Family Friendly Cincinnati is a little plain. We’re a gaggle of volunteers and starting a brand new scheme in our community. Your site offered us with helpful information to work on. You have done an impressive task and our whole neighborhood can be grateful to you. We spend a lot of time at The Aquarium in the winter!